Yesterday was Spud's first day back to school after having a lovely six weeks off school! During the summer term, we went on holiday to Cornwall and spent 10 lovely days with my mum, step dad and little sister, it was also Gareth's first time meeting them, so it was a double occasion! We also had fun days out, play dates and lots of fun at home! Admittingly, lunch was all over the place during the holidays, we had lunch treats whilst out and about, and lazy lunches whilst at home, but its only once a year and it was nice to not be so strict. However, now Spud is back to school, it's back to lunchtime routines, with lunches being packed carefully at home, and the right hot school dinners being picked. Yesterday, Spud wanted a hot school meal so he could see the friends he's missed during the summer period. Every single one of his friends are school dinners, and he's the only one who has packed lunch. Where I've only got one child, I don't mind paying for Spud when he wants to have dinner, I reckon the cost is around the same as a packed lunch. 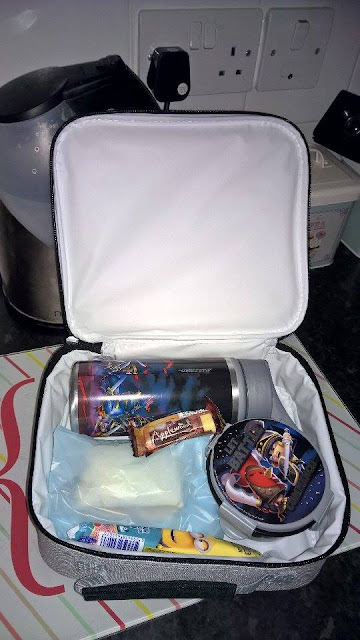 Today though, as much as he's missed his friends, and loves to have lunch with them, Spud wanted a packed lunch, not because of the food may I add, but because he wanted to show off his World of Warriors products, and I can't blame him, they're brilliant! 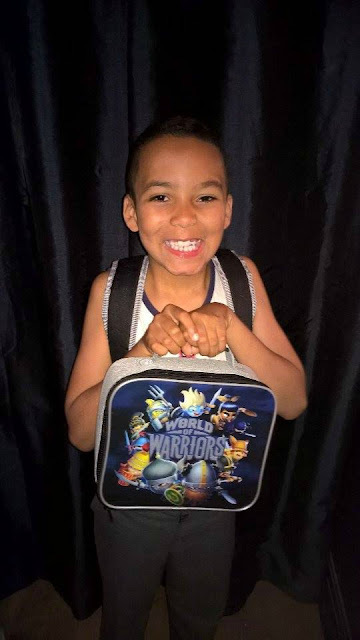 World of Warriors is the latest brand from the brilliant Mind Candy, the fabulous brand behind the ever so popular Moshi Monsters and the World of Warriors are here to help parents and children with children's lunches! Their aim is to get the right stuff into children at lunchtime, and with some brilliant lunch idea's stormed up, me and Spud can't wait to try out some of the ideas! World of Warriors teamed up with leading child nutrition consultant Charlotte Stirling-Reed, with both parties wanting to help parents across the country minimise the stress out of school lunch preparation by creating a go-to weekly meal plan that contains quick, simple and delicious well-balanced lunches that the kids will love! The meal cards (one for each day - Monday to Friday) contain simple and easy, but effective and healthy lunch time ideas that take no time at all. One side of the cards has the meal plans, whilst the other has visual pictures for your child to see, both sides contain a character, with each day hosting a different character. Roman Rampage Pitta Pizza: A small wholemeal pitta bread with a spreading of tomato puree, a spoonful of sweetcorn or mushrooms, squares of ham and cheese. Heroic Wholemeal Pasta Salad: Wholemeal pasta with tuna and sweetcorn, mixed together with natural yoghurt. Stealth-Conscious Sarnie: Houmous and cucumber or egg and cress in between a wholemeal bread roll. Aztec Fury Wrap: Mighty chicken and salad wrap (lettuce, onion and tomato) in a small wholemeal wrap with or without couscous. Brutus' Bone-Crunching Crackers: Four wholegrain crackers with Marmite and cheese. 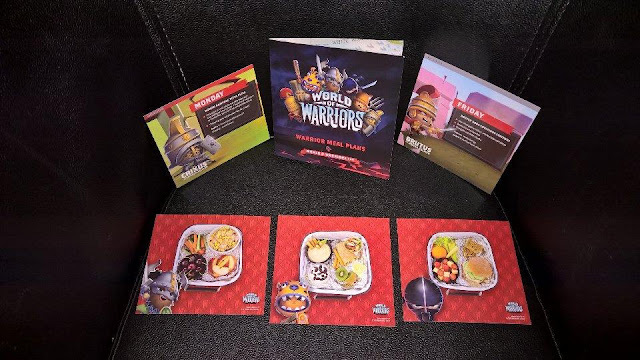 The meal suggestions are designed around the five most popular World of Warriors characters; Crixus, Gunnar, Kuro, Zuma and Brutus - to help educate and encourage children to make an association between healthy food choices and fun. Although we didn't use one of the meal plans today, Spud had a brilliant lunch with his new items and I was pleased to find I could fit quite a few items into the lunch box! Spud was luckily sent a few extra's including a sticker activity book, and activities such as; word search, spot the difference, a maze, a colouring in sheet and a how to draw character guide. 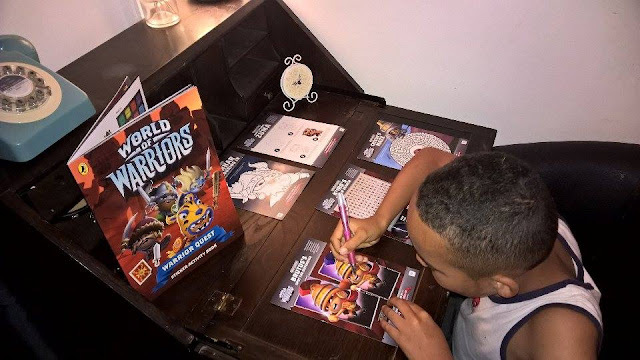 After a hard day at school today, he couldn't wait to get stuck in and start completing his World of Warriors quest! If you've liked what you've seen in this post, and want to get your hands on a set, then look no further because the World of Warriors have very kindly put a set aside for one lucky reader/visitor of Unique Young Mum to win! With a value of £23.99, check out the next post (link here) to be in with the chance of winning the set for yourself! 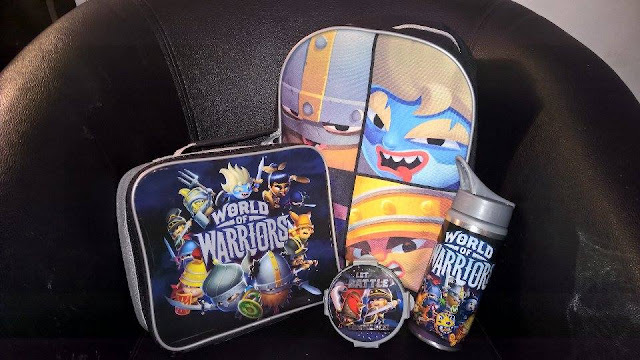 The World of Warriors range is available to buy in leading supermarkets, online and in children's toy stores. Prices range from £1 to £10. To enter the competition to win a set yourself, visit this post here. To find out more about World of Warriors, check out the official website here.